Charcoal pencil drawing on cartridge paper showing the first figure of Paul Spooner's 'Five Artists Reflect On Their Waning Powers' (W49). The figure is drawn behind a table with one hand on the edge and the other stirring a cup of tea. Charcoal on cream cartridge paper. 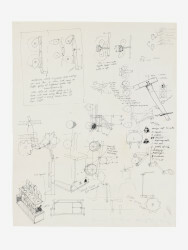 Working Drawing, 'Five Artists Reflect On Their Waning Powers', Paul Spooner, 1983, © Paul Spooner, Crafts Council Collection: AM445. Photo: Stokes Photo Ltd.